Last week we began an educational series on the important role and various functions of our United MEC Government Affairs Committee. 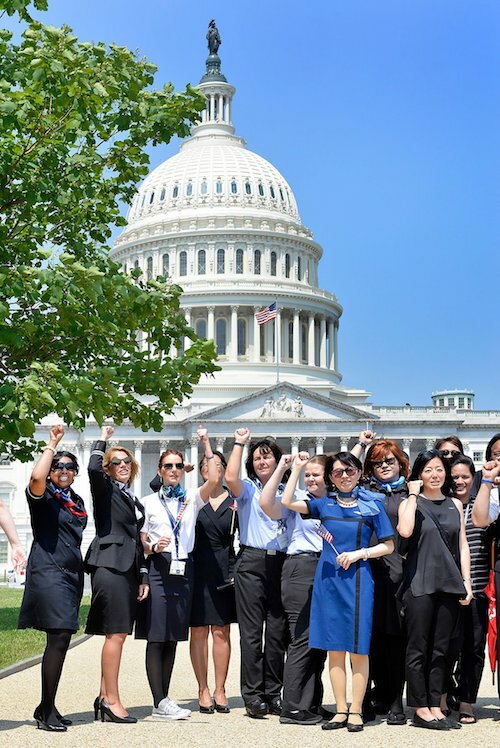 This week we continue this series with an introduction to AFA’s involvement on Capitol Hill and the role of our volunteers in promoting progressive labor and social legislation for Flight Attendants. Today, we are finding it increasingly necessary to approach the United States Congress to make changes to Federal Aviation Regulations which affect our workplace. In these discussions it is critically important that we have representatives who support the values and priorities of our Flight Attendant community. For this reason, we must work to help elect and keep in office candidates and incumbents who share our concerns about our security, health and safety within our industry. AFA-CWA is known on Capitol Hill as the world's largest Flight Attendant Union and the only one that represents a cross-section of our entire profession. For decades, members of Congress and the federal government have not only respected our knowledge of the industry, but have turned to us in times of crisis. When legislation that affects Flight Attendants is being proposed, AFA is the first and in most cases, the only Union that is contacted because of our status as the largest representative of Flight Attendants. Our steadfast work on behalf of Flight Attendants and aviation safety has increased our visibility and has contributed to a well-respected presence on Capitol Hill. Our greatest successes have been achieved when the United AFA Government Affairs Committee join the Government Affairs representatives from the other AFA carriers and speak with one voice. Notably, this can only be accomplished through our Members and their direct support to our non-partisan and independent Political Action Committee, FlightPAC. It is our Members direct contributions to FlightPAC that allows us the opportunity to actively participate in the advancement of issues important to Flight Attendants, our industry on Capitol Hill and to support campaigns for AFA endorsed candidates. We encourage Flight Attendants to review the detailed information on the overview of FlightPAC Endorsement/Disbursement Procedure available on our website. FlightPac makes a difference for the Flight Attendant profession. By contributing to FlightPAC, you invest in your future and assist in the pursuit of legislation designed to improve our work environment and secure the future of our profession. In this Friday’s e-Lines edition, we will share with you how you can personally make a difference by contributing to FlightPac. Following the educational series and beginning April 1, 2019, we will conduct FlightPAC roadshows in domiciles across the system in an effort to further raise awareness and support of our United AFA Political Action Committee. This is a critical investment in our future as we work to carry our message loudly and clearly, as a single voice, to our elected representatives in Washington, D.C.
Additional information detailing the ongoing work of the Government Affairs Committee can be found on our MEC website at unitedafa.org.